The first TTR is also the simplest and best introduction for people new to the game. 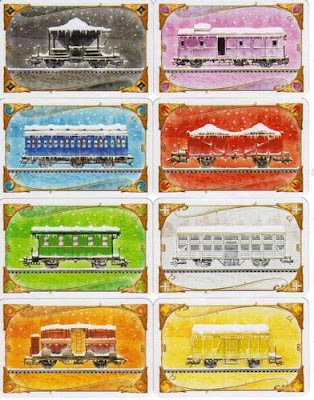 In short, you collect sets of coloured cards which you use to claim coloured routes between different cities. 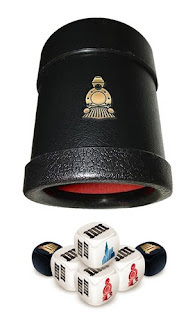 What makes the game interesting are the tickets you take which you must try and fulfill. 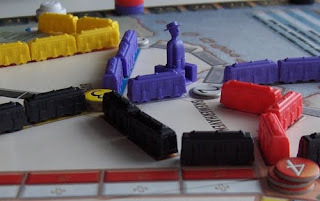 Each ticket has a point value and gives two cities which you must try and connect with an unbroken chain of trains. Here's the thing: if you don't make the ticket, you LOSE the number of points you could have made. And this is what makes the game so deliciously fun. Should I try to take more tickets? What if I don't get one that I can make. So once you get tired of the original USA map or feel like you've memorized all the tickets, this is your solution. This is a whole new set of tickets (and another set of train cards in case yours are worn out). 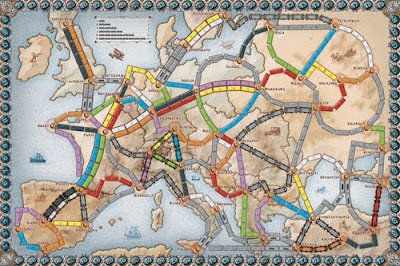 Two more variants can be played, Big Cities, which has tickets each of which connects to one of only 6 cities on the board. Fiercely competitive and a bit much for me. The Mega Game combines all the old and new tickets to breathe new life into the original. And it works. Although, the map is the same the routes feel totally different. I love this one and play it online all the time. An afterthought, really. Some new tickets and some special cards but not worth the investment. Adds some more randomness to the game but doesn't really change much. Meh. I must admit my first impression of this wasn't very good. It felt a little too different from the original for my tastes. I now own it and play it regularly. The major changes introduced here are the tunnels which add an element of uncertainty as to whether you actually can claim a route at all and the stations which let you borrow other people's routes to complete your own tickets. This is a great one if you're a fan of the series and wanna try something a little different. My absolute favourite in the series and also the most derided by many of the fans. The map is in Germany and the gameplay is pretty similar to the original except for one thing: passengers. Each player has three passengers which can one trip around the board on that player and sometimes other player's routes. At each city, the passenger picks up point tokens of strictly decreasing value. This adds much more to the decision-making and a delightfully agonizing element of timing. It also adds to the play-time but I could care less since this version feels like a true gamer's game that I can still play with Mom. Great, great, great. Probably my least favourite game of the series but still fun. It requires the original set as it is only a map and tickets. This one is only for 2-3 players and includes ferries, tunnels, and countries to connect to. Less interaction, though, but since you only play with 40 trains it is a bit quicker. If it didn't just play for 2-3 players, this complete game would easily be my favourite in the series. With ferries, tunnels, and special rules for the locomotives, this map is challenging. Add to this the nasty interaction between the players produced in this one, and you have a great, very tense game. And the artwork and colour choices are easily the best in the series which is an added bonus! 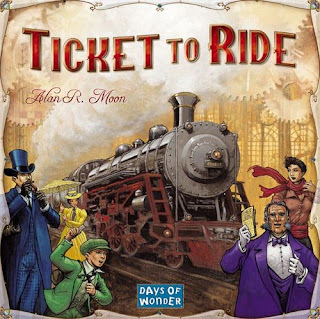 I have yet to pick this one up, although I imagine it is fun (I trust Alan Moon). Part of the reason is that it seems similar to two games I already have and don't play enough of: Mamma Mia and Union Pacific. The memory element seems similar to Mamma Mia and the rules for the laying down of cards is reflective of some older Moon games like Get The Goods or Union Pacific. I'm sure I'll own this eventually but with my game budget, there are higher priorities right now. Any opinions? I haven't played all versions.. but I like the original USA map and the Marklin versions best :D... I haven't played in Ages though, perhaps I will teach it this semester!